Looking for a professional Warren carpet installer to complete your new flooring project? The Carpet Guys have some of the best carpet installation crews in Warren, MI. Our shop-at-home flooring service brings the entire carpet store right to you. Imagine seeing a selection of carpet samples next to your furniture in your home's natural lighting rather than harsh showroom lights. 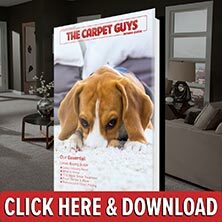 Buying new carpet in Warren doesn't have to be difficult. We have multiple types of carpet that can accent the beauty of any home. Each carpet material comes with their own specific look and feel, providing homeowners with multiple options to choose from. For any formal kind of setting in the home, dress those rooms with our wonderful Plush Carpet. It has an attractive velvet like finish and adds a luxurious look to any room. It also comes in different colors to fit almost any decor in the room. If a quality casual style fits your home best, our Frieze Carpet is the material of choice. Frieze can offer a nice flair and personality to any kind of room. For homes that experience a high amount of foot traffic, Berber Carpet is the way to go. It is very durable and hard wearing, so it works for any popular room. Plus, it satisfies the appetites of the outdoors man with it's earthy tone and texture. To get a really interesting feel underfoot, having Looped Carpet installed is a good idea. It comes in multiple styles and has a wide variety of colors, making it a popular choice for any room in the home. For all of your Warren carpeting needs, contact The Carpet Guys. Schedule a free in-home estimate by either calling in or filling one out via our website. With The Carpet Guys taking care of you, your satisfaction is guaranteed. Schedule an Obligation Free In-Home Carpet estimate!